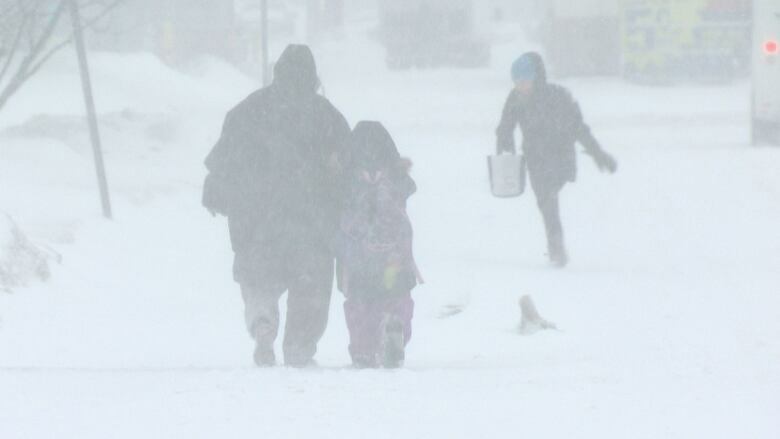 A blustery, cold and snowy Sunday is in store as Environment Canada's extreme cold warning and winter storm warning continues for much of eastern Ontario. In Ottawa, the temperature will only rise slightly to a high of –16 C, which will feel like –25 in the afternoon, with winds gusting up to 40 km/h. The snow will be heavy throughout the morning before becoming lighter in the afternoon, with another seven to 12 cm expected to fall by Monday morning. The amount of snow has made roads slippery. There have been 11 collisions on Highways 417 and 416 between midnight and 9:30 a.m., said Ontario Provincial Police Sergeant Cynthia Savard. Ontario Provincial Police are warning drivers to stay off Highway 401 and other highways across the region. A number of flights are cancelled at the Macdonald–Cartier International Airport. Anyone set to travel is urged to check their flight status before heading to the airport. An overnight parking ban will also be in effect between 1 a.m. and 7 a.m. Monday as crews work to clear city streets, the City of Ottawa wrote in a statement. Vehicles won't be allowed to park on the street between that time, but on-street parking permit holders are exempt, the city said. Free parking is being offered at all city-owned covered parking garages during that time.